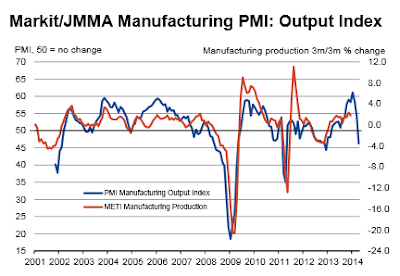 Summary: Japanese manufacturing firms saw a decline in output for the first time in 14 months in April. Alongside this fall in output was a deterioration in new orders which also decreased for the first time in 14 months. In both cases, firms linked the reductions to the rise in the sales tax. The headline seasonally adjusted Markit/JMMA Purchasing Managers’ Index™ (PMI™ ) – a composite indicator designed to provide a single - figure snapshot of the performance of the manufacturing economy – posted at 49.4 in April, down from 53.9 in March. This was the first time in 14 months that the Japanese manufacturing sector saw a deterioration in business conditions. Output fell to the greatest extent seen since December 2012. The main contributor according to anecdotal evidence was a decline in demand. Indeed, similar to output, new orders decreased, with evidence suggesting the increase in the sales tax was the main factor behind lower new orders, as clients had brought forward purchases in March to avoid paying additional costs the following month. One month does not present a complete picture. However, Abenomics has so far resulted in a declining Japanese balance of trade, inflation (foolishly wanted), little to no increase in exports, and soaring import costs (especially food and energy). For those results, many leading world economists think prime minister Shinzo Abe is a hero. In contrast, I think he is a fool.